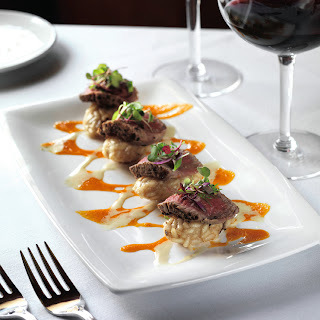 Last year, Flemings Prime Steakhouse launched my ideal dining experience - small plates and big pours. 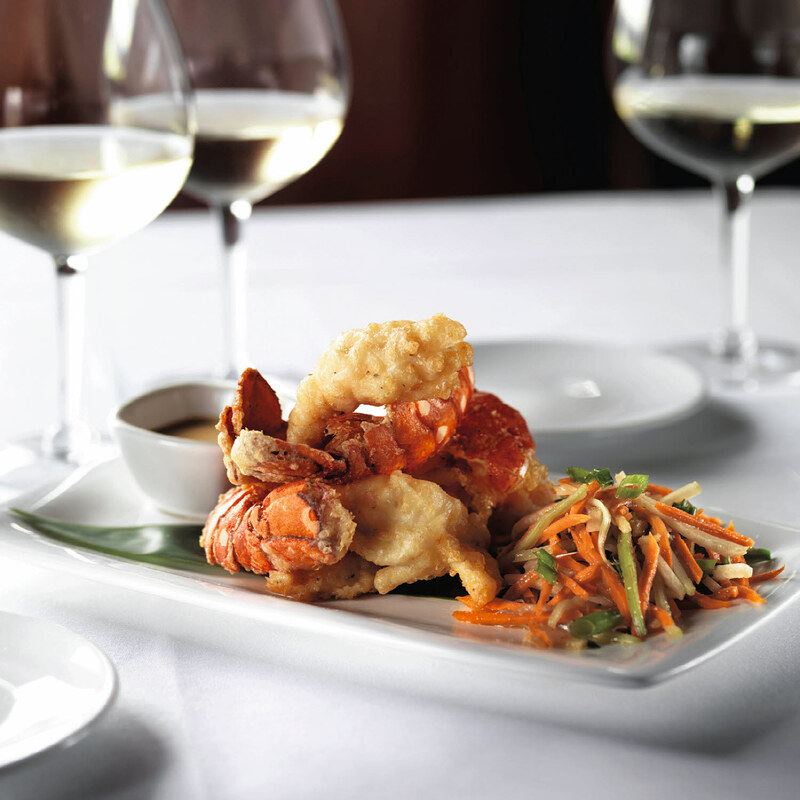 For $24.95, you can pick between 7 amazing dishes, paired with one of Flemings seven premium 9oz Big Pours, each carefully selected by our Director of Wine, Maeve Pesquera, to guarantee the perfect pairings. As much as I love food, I don't have a huge appetite so the small plate, big pour is an ideal dinner for me. I can get a large glass of wine with a perfectly portioned plate of amazing food. Before I start my review of this amazing dinner, I have to state the photos below are all propriety rights of Flemings as my laptop has once again ruined my memory card with all of my personal photos of this dinner. If any computer specialist can help me, please email me....this is my second memory card and the second laptop this has happened to within 3 months. 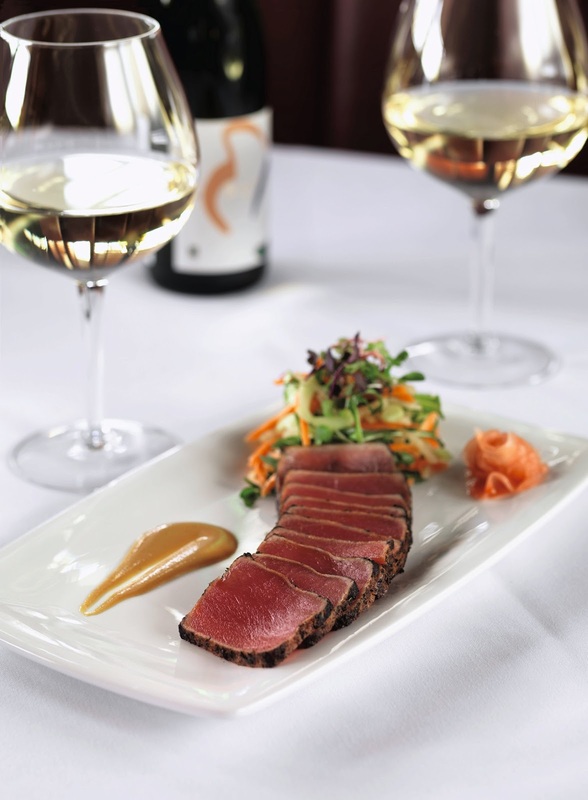 For our Small Plates and Big Pours Dinner, I opted for the Seared Ahi Tuna, paired with Pinot Noir (A to Z Wineworks, Oregon). My tuna was cooked to perfection with a spicy rub. It was paired with a vegetable slaw salad. It was delicious and I would absolutely come back and order this again. I have dined at Flemings multiple times. Aside from two events there, this was my first time personally ordering a seafood dish at Flemings. I couldn't be happier for my ordering decision. 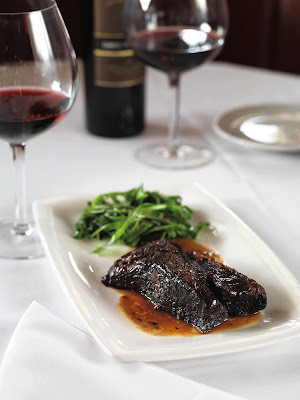 Gabe ordered the Sliced Filet Mignon paired with Merlot, (Esk Valley, Gimblett Gravels, New Zealand). The Filet was atop a mushroom risotto cake and had a delicious spicy drizzle. Gabe talked about this dish the entire way home and I have to see if I can bribe Flemings chef for the spicy reduction recipe. And finally, last but not least - my friend Leslie (Dash of Les) ordered the Braised Short Ribs of Beef paired with Cabernet (B.R. Cohn, Silver Label, North Coast). I love a good short rib and this was exactly that. Overall, Fleming’s Prime Steakhouse & Wine Bar’s Small Plates is the perfect excuse for a cheap date night or a fun girls night out. I strongly encourage you to check it out while it's here. 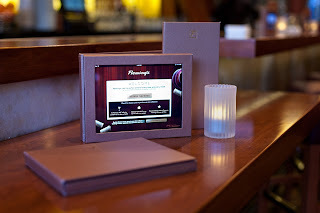 While you are at Flemings, make sure you take a peek at Fleming’s WiNEPAD™, a program created just for Flemings. If you ever find yourself in a "what glass/bottle of wine should I order" predicament, Flemings has created a fix for that. You can easily navigate the restaurant’s extensive wine list (at your table or at the bar) and tell the WiNEPAD what you want to eat - it will then suggest wines. Or you can play "Spin the Bottle" which will do just that - randomly suggest a bottle of wine to your table. The application was developed by National Wine Director Maeve Pesquera, and the brand’s National IT Training Coordinator Craig Sheppard. Pretty genius if I do say so myself. Sounds like this is a great concept! I really do love small plates - trying more than one dish is ideal for me!